On Friday 02 May Defected In The House joins forces with Mixmag Live for the first party of the Defected15 Club Tour at London’s Oval Space. Performing on the night will be Noir, Osunlade, Chasing Kurt (Live), Simon Dunmore, Copyright, Sam Divine and Sonny Fodera. In addition, it was recently announced that Guti will also be making a guest appearance to perform his celebrated live show. 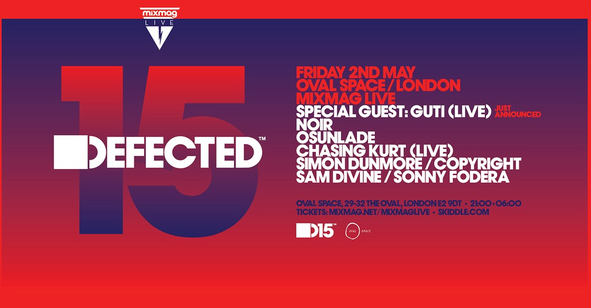 Located next to the Bethnal Green gasholders in East London, Oval Space is the ideal space in which to kick off the Defected15 Club Tour.In addition to the party, Mixmag’s June issue (which hits the shelves 15 May) will be dedicated to 15 years of Defected. 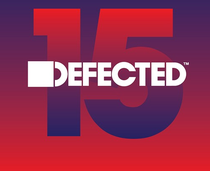 The issue will feature an extended interview with Defected founder Simon Dunmore as well as interviews with all the artists playing the event, while the covermount CD – mixed by Noir – will feature 15 defining records from Defected’s history. The Defected15 Club Tour is series of events that aims to bring the best in house music to Defected fans around the globe. The tour – which will also take in four major festivals around the world – will see appearances from an array of house talent, including Agoria, Green Velvet, Guti (Live), Huxley, krankbrother, Kenny Dope, MK, Nick Curly, Noir, Oliver $ and Second City.